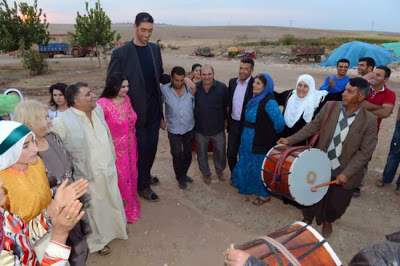 Mr Sultan Kosen, a current Guinness world’s record holder for the tallest man in the world is now a married man. 30-year-old Sultan, height 8’3″ married his sweetheart, 20-year-old Merve Dibo, height 5’8″in Turkey on Sunday October 27, 2013. Though the bride appeared very tiny besides her giant husband,family sources claim the two have “natural” love for each other. Since his victory in 2009, Sultan Kosen recently gave up his search for love when almost every lady he came in contact with rejected him but alas, he came across Merve and the rest is history. The wedding that held in his home town of Marin in Turkey yesterday was graced by several celebrities and high ranking officials in the country. Notable figures who attended the event include Abdullah Gul,the current president of Turkey and Prime Minister Recep Tayyip Erdogan, as well as religious leaders and high-profile businessmen. World’s tallest man, Sultan Kosen who suffers from a rare genetic disorder called pituitary gigantism had to have a custom wedding suit made for him. 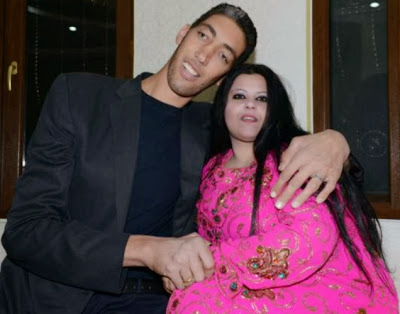 Apart from being the world’s tallest person, he also has the world’s biggest hands at 27.5 centimeters (11 inches) long. He wears shoes size 28. In 2008, Doctors removed a tumour on his pituitary gland believed to be the cause of his nonstop growth. ‘The kids used to tease me and I found that very difficult. But now I am really proud of being tall.’ – Sultan Kosen said during a recent interview in Britain.